The performances that conquer a portion of time get recognition as hits. Our legendary artistes own a treasury of hits and we saregama HMV are happy to be its curators. We recorded the great artistes during their prime era, preserved their art from efflux of period and keep on releasing it every time when the new age is craving for it. The epoch of these messtros is a source of inspiration to the future generations also. Ustad Zakir Hussain is an illustrious son of a renowned son of a renowned father Ustad Alla Rakha an exponent of the Punjab gharana of table. This gifted person has scaled all the mountains of success in the world of rhythm. He started his training in table at the age of seven and played his first concert as an accompanist at the age of twelve with none other then sarod-maestro Ustad Ali Akbar khan. Now in his fifties Ustaz Hussain has come a far way and become one of the chief designer of the world music. The trend of the world music is going rhythm oriented. Ustad Zakir Hussain was the first Indian to recognize and introduce this in Indian music. The same ability took him to the world arena of music. He formally trained himself in the stream of world music and then rightfully ventured into fusion music. As a soloist as an accompanist and as a co-artiste in fusion events Ustadji is just unparalleled. 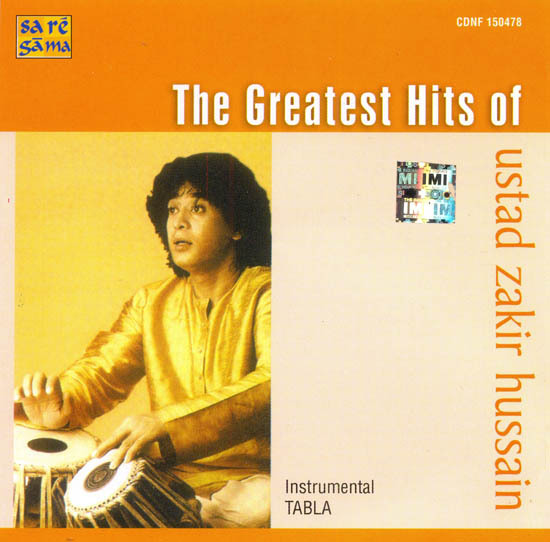 Ustad Zakir Hussain has made Tabla a craze world over. He brings out poetic element in Tabla while playing a solo and underlines dramatic element in Tabla while accompanying great instrumentalists. His Punjab Gharana plays Tabla with open sounds (like Pakhavai). The trend of the world rhythm also leans towards open sound. So it was but natural for Ustadji to carve a niche for himself in the world of international music. His collaboration with ‘Shakti’, Diga Rhythm Band’, ‘Hong Kong symphony and New Orleans symphony are very successful ventures. His album makind music is considered to be a happening in fusion music. His another album planet drum fetched him a grammy Award. In India he has won sangeet natak akademi Award and has been conferred with Padma Bhushan a civil honour. While presenting some of his hits in this album we have selected his solo performances and also accompaniments in his two stages as a youth and as a matured professional.